AutoAuditorium System scenarios that can work for you. 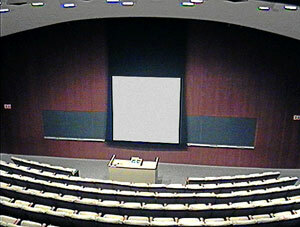 Pictures of typical system installations are on the AutoAuditorium Installations page. 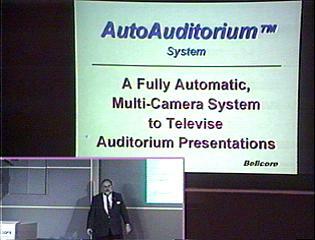 The AutoAuditorium system and its predecessor experimental prototypes, known as I-See-You Camera Control and I-See-You Director, were in use at the Telcordia Technologies (formerly Bellcore) Morristown NJ Auditorium since 1993. Since the late 1990s, when it became a commerical offering, it has been used regularly by Telcordia Technologies' employees. 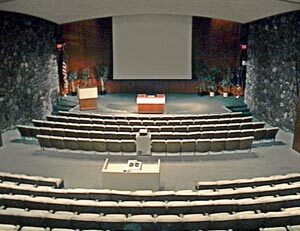 Many talks and presentations given in the Telcordia Technologies Auditorium in Morristown NJ were telecast and recorded automatically. The recordings were loaned to people who could not attend the events and cataloged in the company libraries for circulation. For several years Telcordia Technologies had an experimental desktop video conferencing system, known as Cruiser, that at its peak served about 100 people. AutoAuditorium recordings of some talks were placed on a video-on-demand server and watched later through the Cruiser system. The Cruiser Talk of the Week was a popular service. Rehearsing presentations in the AutoAuditorium environment let speakers see and hear how their material comes across, which helped them refine the content and presentation style. To see what a digitized AutoAuditorium video looks like, go to our Video Demonstration page. The system can be useful in many other environments. Large corporations have situations that suggest AutoAuditorium uses. The simple example is telecasting and/or recording any presentations in the company auditorium. If it's important enough to attract an audience that big or to call for that formal a presentation space, then it's important enough to share with those who were on-the-road, ill, or otherwise occupied at the time. Which of the possible distribution channels to use is an open question, but with low cost of blank DVDs there is almost no expense to making another recording. Corporate training is an important part of keeping employees sharp and up-to-date. But how many times have you been at a course and seen someone drop out because they suddenly had an emergency back at the office? Do you think they ever get to make up the days they miss? With an AutoAuditorium system scaled down to classroom size, a recording of the missed days would allow those who were called away to catch up on the material they missed. Not all presentations need to be seen by the largest possible audience. Sometimes, the the event is a presentation of sensitive information and it is inappropriate for a video production crew to see and hear the material. In that case, an AutoAuditorium recording is the ideal solution. Anyone can put the blank disk or memory stick in the recorder and press the AutoAuditorium START button before the presentation. Press STOP and EJECT, and you now have a fully produced, ready-to-watch recording that has not been seen by anyone else. A hospital, especially a teaching hospital, is an example of organization that can rarely bring everyone together for a meeting. There is always someone who must be on duty and thus miss an important activity. In this environment, the AutoAuditorium system can capture events for those too busy to attend. For those who have to be at the nurse's stations, they could be telecast on the in-house cable TV system or over the computer network (if it can handle multimedia traffic). Telecasts could be sent to other locations, on DVD, via teleconferencing connections, or as computer files, saving people at associated hospitals the need to travel to attend talks. Hospitals also have to serve some of the social needs of its patients. For example, religious services performed in the auditorium could be televised over the in-house cable system to patients unable to attend in person. Similarly, a hospital often sponsors events for the community they serve. Talks given on current health and medical topics could be made available as recordings available at local public libraries or over public access cable TV channels. In each of these cases, using the AutoAuditorium system to capture the event would reduce the opportunity and personnel costs of creating the telecast. Because the system is as simple as turning on the power and hitting RECORD, it will be used often. The cost of creating the next telecast quickly becomes very small. Educational institutions are facing the challenges of a mobile population. Many schools offering continuing education courses and degrees for employed students find that their pupils have difficulty keeping regular class hours because of job pressures. 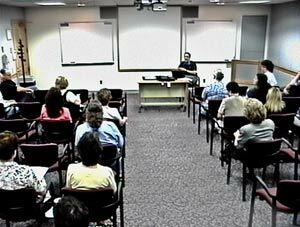 Using AutoAuditorium techniques to capture classes for students, recordings can be made available through the mails on DVD, via community cable TV, via satellite, or over the Internet; in fact, AutoAuditorium programs can be sent on any medium that carries television. Also, school systems with distributed campuses can use AutoAuditorium systems to share events among their students and faculty. A presentation made by a national figure can be shared with all the campuses. A seminar on teacher's issues can be shared with the dispersed faculty. and present vital information to viewers.